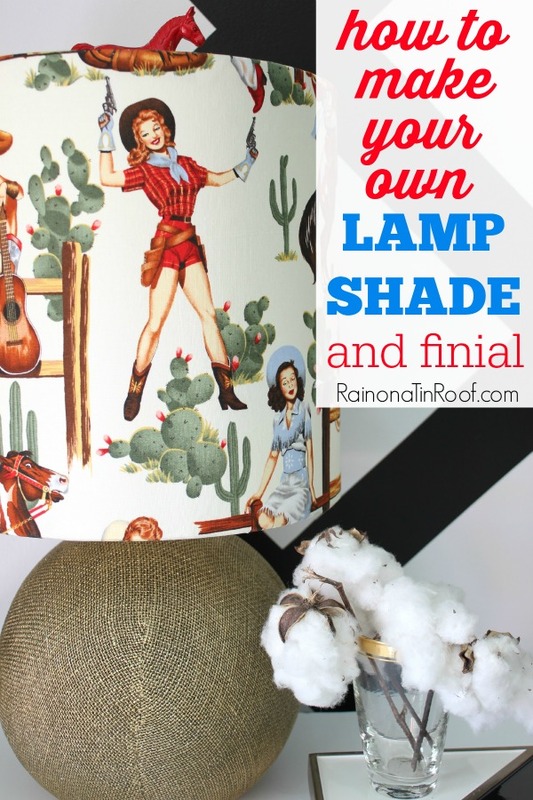 DIY Lamp Ideas - DIY your own lamps, lampshades and more! 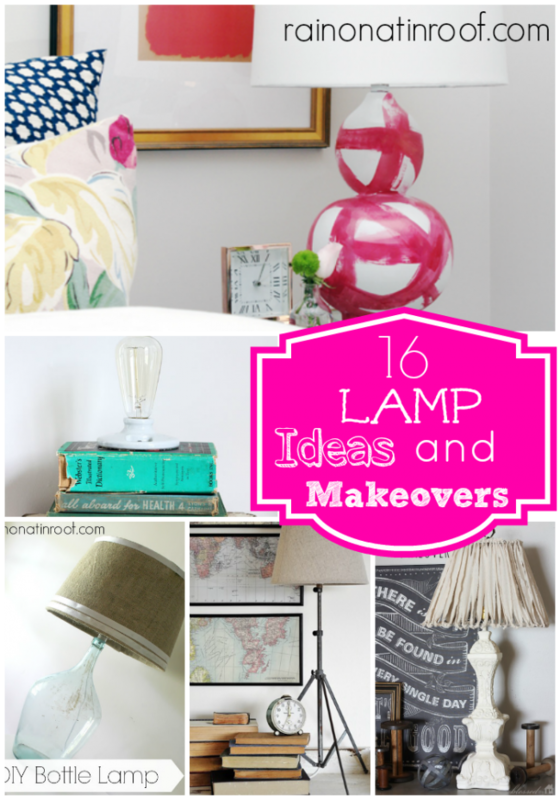 You are here: Home >> DIY Projects >> 16 DIY Lamp Makeovers and Ideas You Can Do Yourself! 16 DIY Lamp Makeovers and Ideas You Can Do Yourself! In my opinion, one can never have enough great lamps. These DIY lamp ideas for lamp makeovers, building your own lamps, creating your own lampshades and more are sure to give you a “lightbulb” moment. I have a serious obsession with lamps. In fact, many would say I’m a lamp hoarder. And they’re right. I totally am a lamp hoarder. I never leave a good one behind. One of my favorite things about lamps though, is that they can easily be made over or made from objects you might already have on hand. And just to prove my point, I thought I’d showcase some of my favorite lamp ideas. Make a lamp out of a bottle. 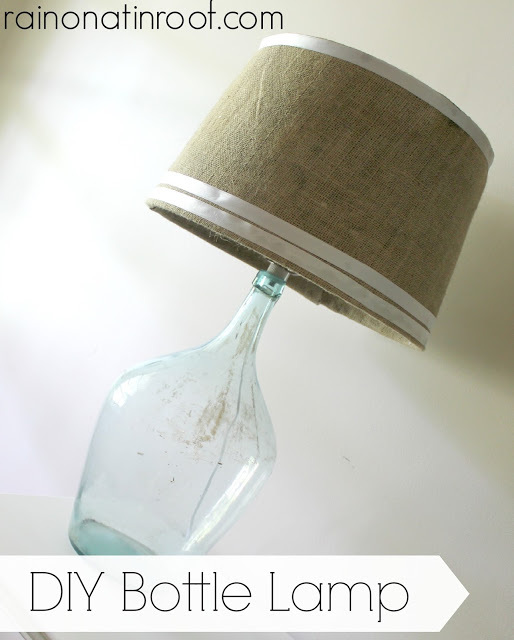 Learn how easy it is to make a lamp out of an old bottle here! Make a lamp out of books! 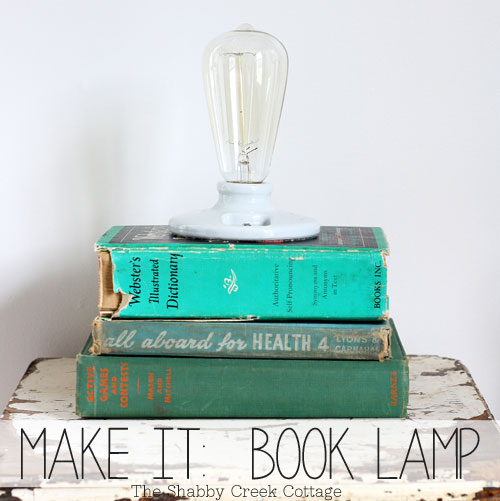 Learn how to make a lamp out of books from The Shabby Creek Cottage! Give a tripod a second life. Breathe new life into an old music tripod with this tutorial from The Painted Hive on how to turn one into a lamp. Reach for some scrap wood. If you have some salvaged or scrap wood lying around, you can turn it into a lamp with these instructions from Burlap & Denim. Reach for light and bright colors. How about a little lamp painting? 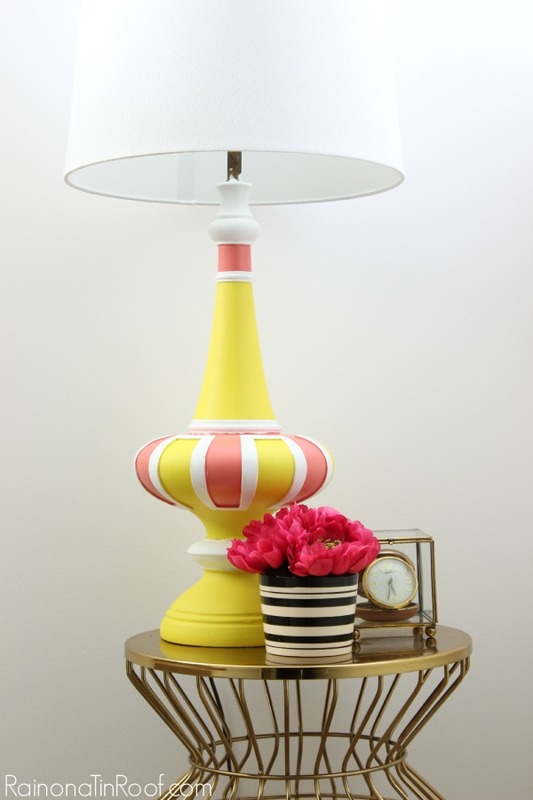 This lamp got a breath of new life with pink, yellow and white. See how I did it here. Get your Kate Spade on. 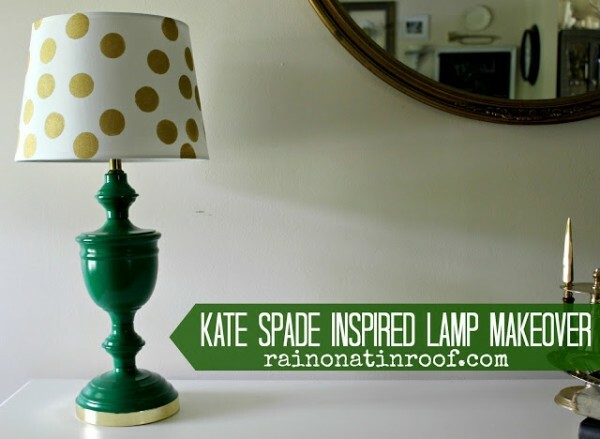 Give an old lamp new life with a Kate Spade inspired twist! 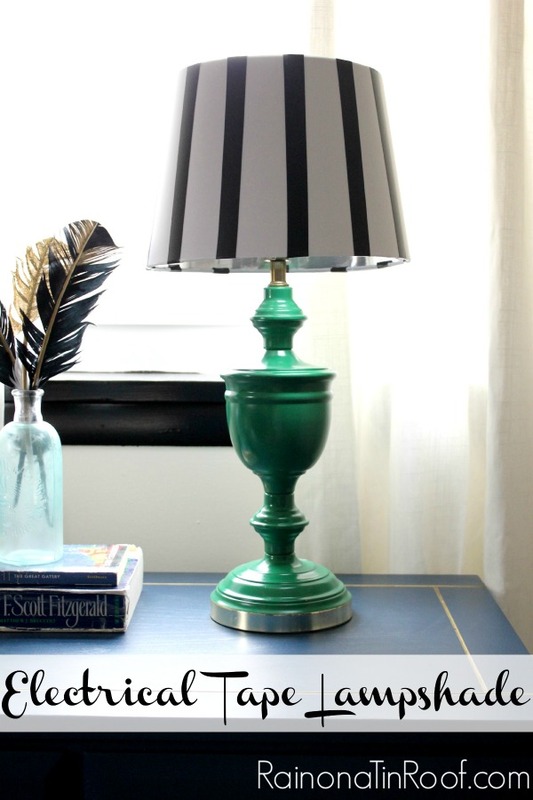 Add some bright blue to your life with this aqua spray painted lamp makeover idea! Update a basic lamp with a roll of cheap wrapping paper with this tutorial form At Home with the Barkers! Get creative with electrical tape! 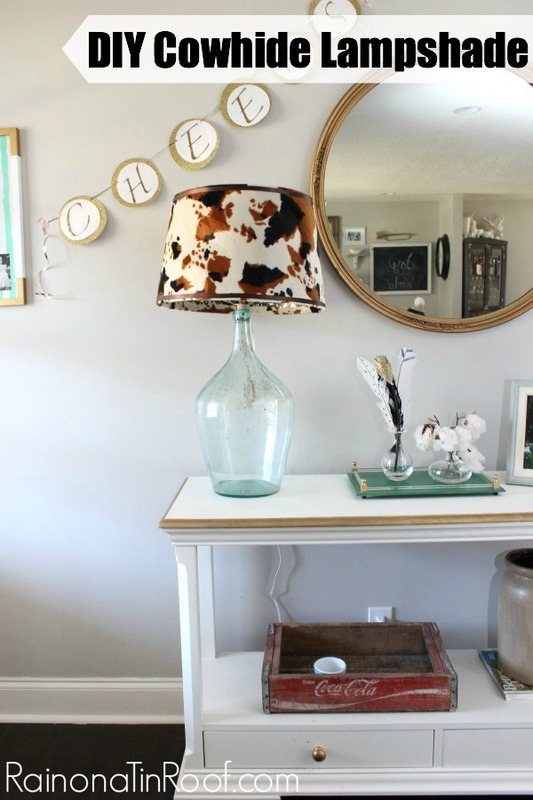 Learn how to recover an existing lampshade with faux cowhide here! Reach for some balsa wood. 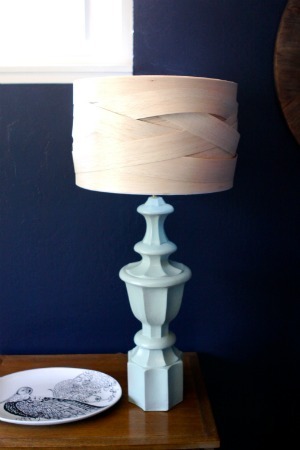 Give a lamp shade a modern twist with this DIY balsa wood lamp shade from Pomp and Circumstance. Got any trim lying around? Give your lampshade a touch of class by trimming them out with greek key trim like Honey We’re Home Did. 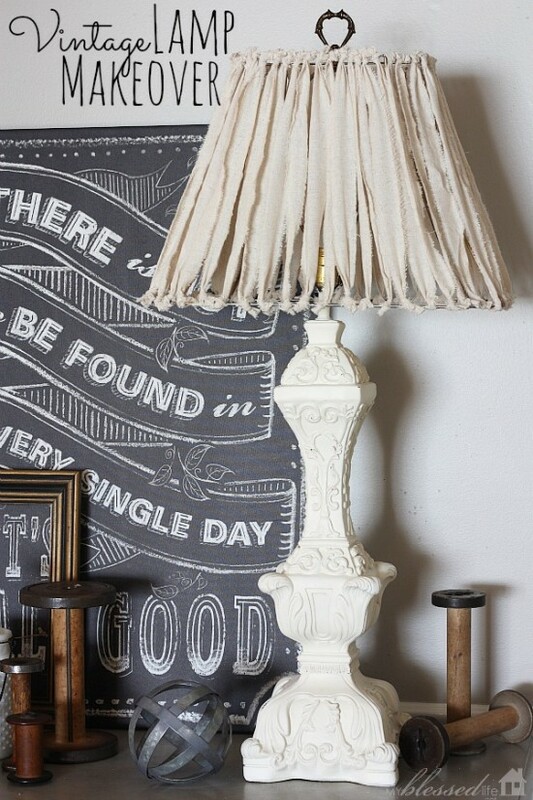 Give your lamps a vintage twist. Love the vintage shabby chic look? Then see how My Blessed Life made over this lamp. Give it a glam touch! 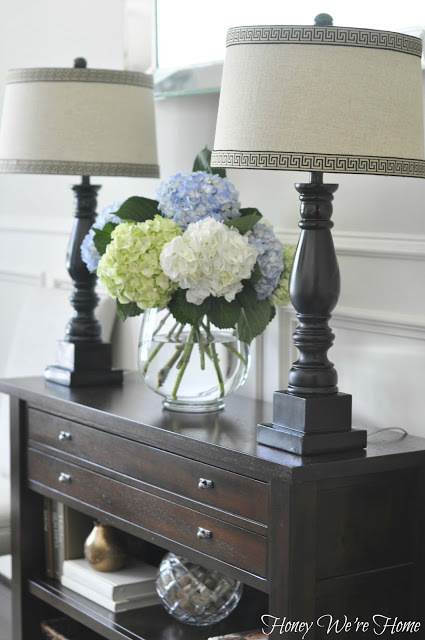 Hands down, one of my favorite lamp ideas for dressing up your lamps is to top it off with a lamp finial. Give your lamps a touch of glam with this tutorial for how to make a crystal lamp finial! Agates are always a good idea. If crystals aren’t your thing, then maybe agates are. 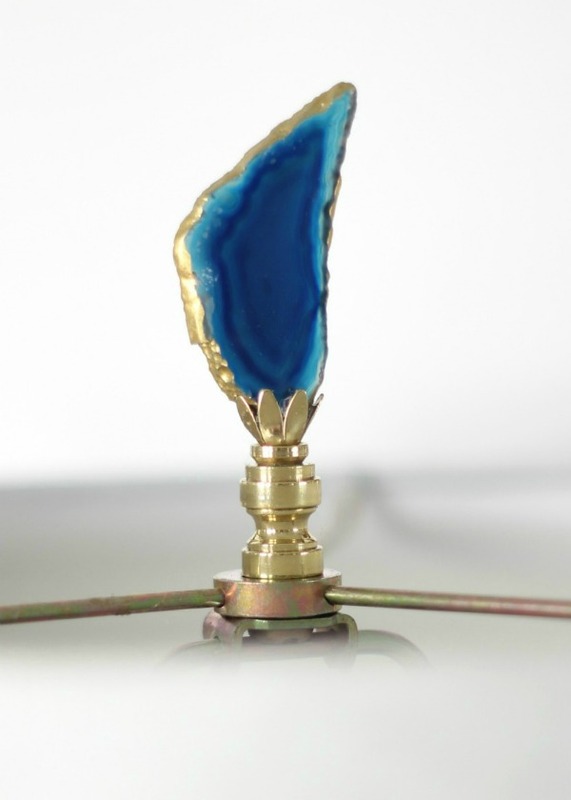 How about topping off your lamps with one of these DIY Agate Slice Lamp Finials? Everything is better with tassels. 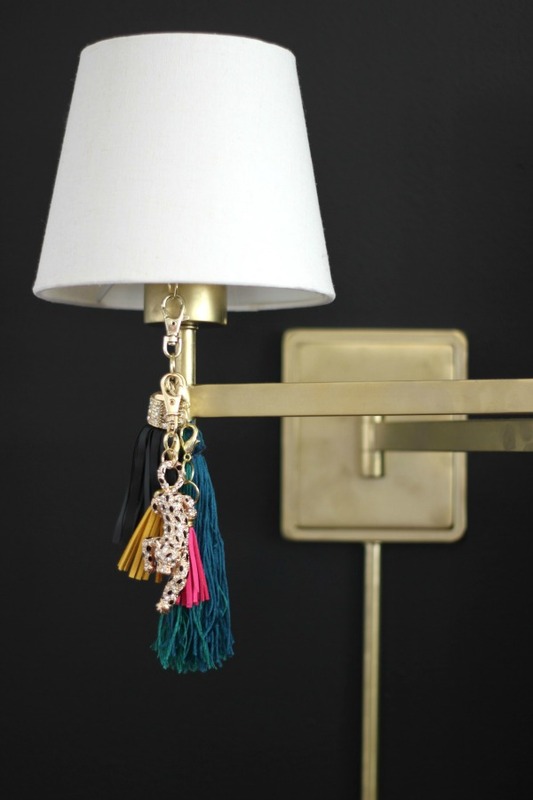 Make these lamp tassels in under five minutes to add a little somethin-somethin to your lamps! Add an unexpected pop of color. 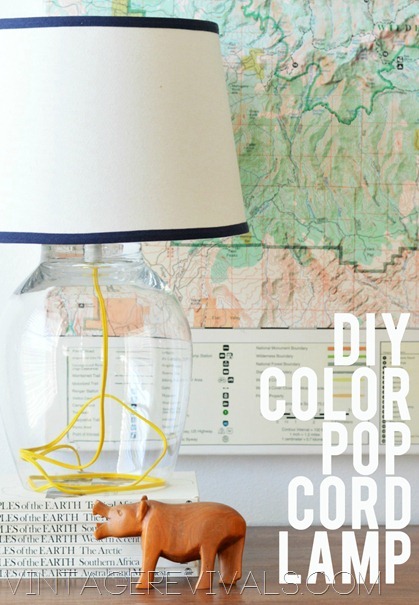 Give your lamp an unexpected twist by making the cord pop with this idea from Vintage Revivals. 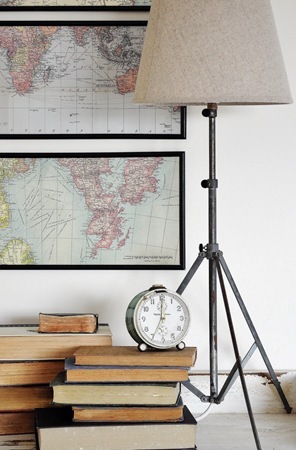 Have you done any of your own DIY lamp makeovers? 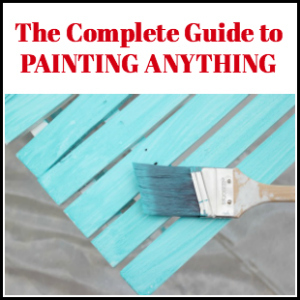 Looking for more great DIY decorating ideas? 7 Super Simple, Super Cute Electrical Tape Ideas – you’ll kick yourself if you don’t take a peek at these! 14 Painted Rug Hacks – gorgeous rugs on a budget! 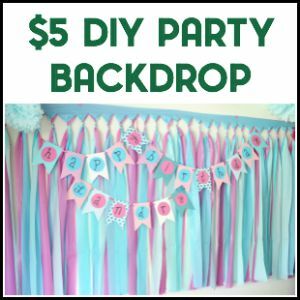 17 Easy Crafts and DIY Projects under $10 – budget projects! 20+ Duck Tape Crafts & Projects – duck tape, a crafter & DIYer’s best friend! Jenna, Great roundup! I especially live the brushstroke lamp and the music stand lamp! Thank you for including my drum shade! I LOVE that brushstroke lamp too – Jackie! I just have to find a lamp to do it to now! Lovely giveaway, I would love to be the lucky one! 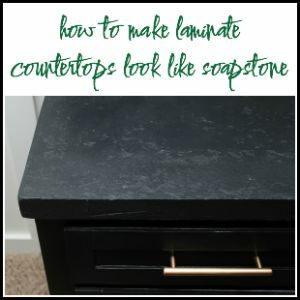 In fact I am doing over a guest room and DIY dresser and would love to have a new lampshade for the room. It is a great giveaway – Kelly – an awesome kit! It is fun, Sonya! And you are so welcome – loved your lamp! 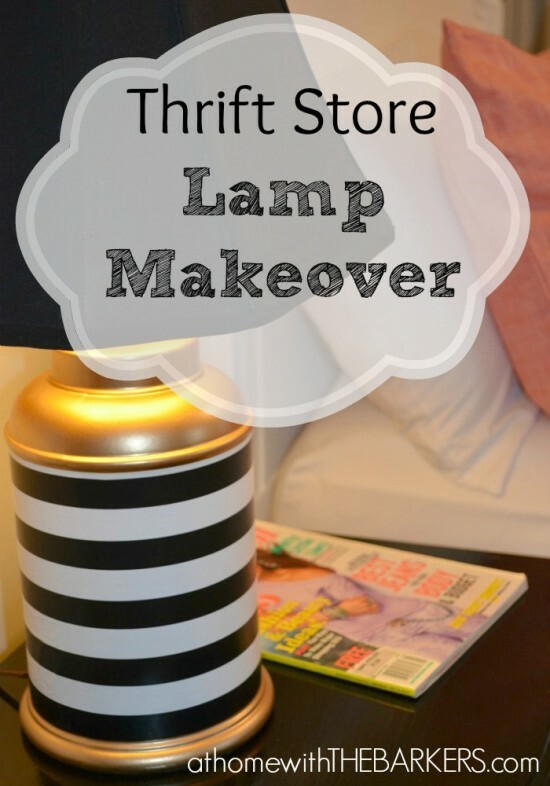 I would love to win a lamp shade makeover kit! So cute and maybe I could actually complete one successfully! Great roundup! 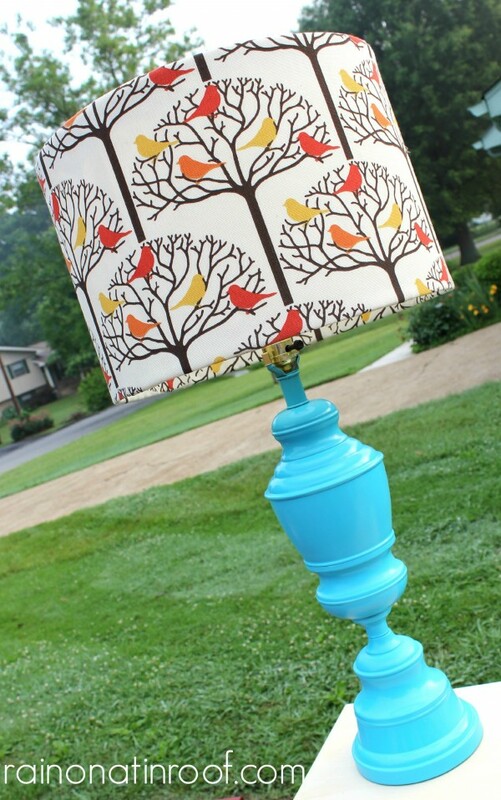 I need to make a few lamp shades, so I would LOVE to win a lamp shade kit. So cool!! Thanks for hosting! It is a really cool, kit, Laura! And a great round-up – lots of inspiration! I know, Angela! As I was writing this post – I was thinking of you and your 12? lamps in your living room! haha! I love the Kate Spade inspired lamp and the one made from the music tripod. Very creative! Thanks, Jennifer! That music tripod one is pretty cool! 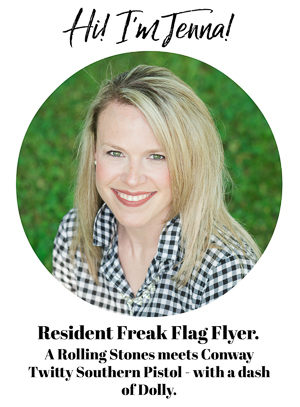 Hey rock star! LOVE this post (but your lamp is my favorite)! Hope you are having a wonderful week! Oh, Karianne, to hear you tell me I’m a rock star and that you like my lamp just makes my day! Hope your weekend was fabulous! There are some cute ideas! Good luck! This is so nifty! Moving into our first home with first baby on way so I’m all about upcycling and thrifting to save money! Yep, Julie, I’m the same way! There are some great ideas here! I know – LOVE that color cord! Lamps are just so much fun! Jenna….it was great meeting you at Haven! Love all these features…wonderful! Hope you have a great week! It was great to meet you as well!! Thanks for stopping by! There are, Jen!! Thanks for the pin and FB love! Awesome roundup, Jenna! Lamps are so hard to find, so it’s great to have a list of ways to DIY them! Hope you have a wonderful week! Lamps are so hard to find! I always end up diying them! Isn’t that tripod one so cool?! Tons of great inspiration! Awesome roundup and a fantastic giveaway Jenna ! I love re doing lamps the all end up in my little one’s room and he loves it! Thank You for sharing at the Fluster Buster Party, have a great week, Lizy your party co host for today! Thanks, Lizy! Loved having you co-host! I swear, sometimes there’s no point in going to a store and looking for a lamp that you want – you gotta look for one that has qualities you want then take it home and make it your own, which is great because then you get amazing projects like these! Awesome round-up full of great ideas! You are so right! And its much cheaper that way! haha! There are some great creative ideas! Man, I can never resist a good lamp makeover! Thanks! Me either, Cindy! I’m a sucker for them every time! Love all the fabulous lamp idea’s can’t wait to see more, great giveaway thanks for the chance. [email protected] chic n shabbies. There is some great inspiration, Elle! Thanks for stopping by and entering the giveaway! So fun! Thanks for linking up at Thursday SWEET HAUTE Share!!!! Jenna, thanks for including my lamp. I am glad I am not the only one who likes lamps or to make them over. You are welcome, Kim! I love that lamp! It seems like I’ve always got a lamp makeover going on! 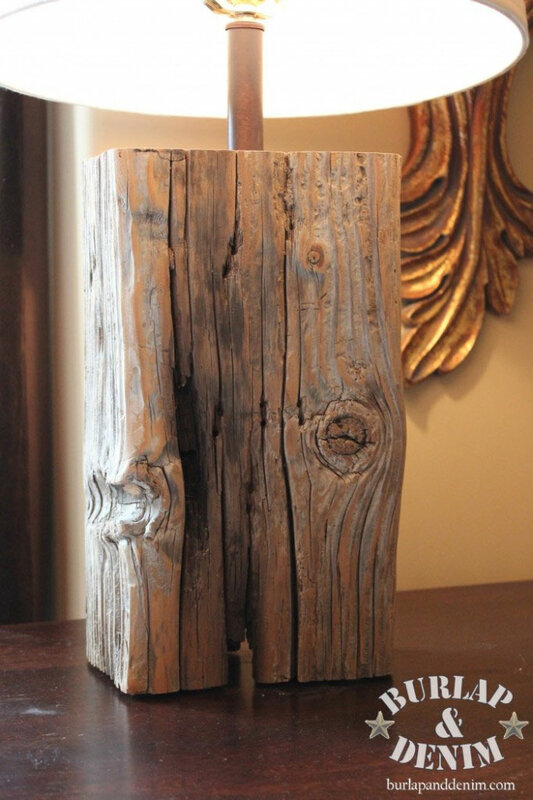 Thanks for featuring my wood lamp! It’s still one of my favorite projects. I love the inspirations from the other sites, especially the book light, adorable. I’m newat this stuff, Is there some way to make a lampshade out of something that isn’t meant to be heated(by the lightbulb? )Is there a way to treat it so it won’t be flammable? I have an old, damaged globe from hubby’s childhood, its dented, not fixable, cardboard, etc. I would LOVE to cut it in half along the equator line and use half as a lampshade- but its cardboard. Any ideas? Or should I just find something else to do with it?My 5 yr old is obsessed with maps and globes, its all over his bedroom, so it would be ideal for him, I just don’t know how or if its possible. Great roundup and so much inspiration!